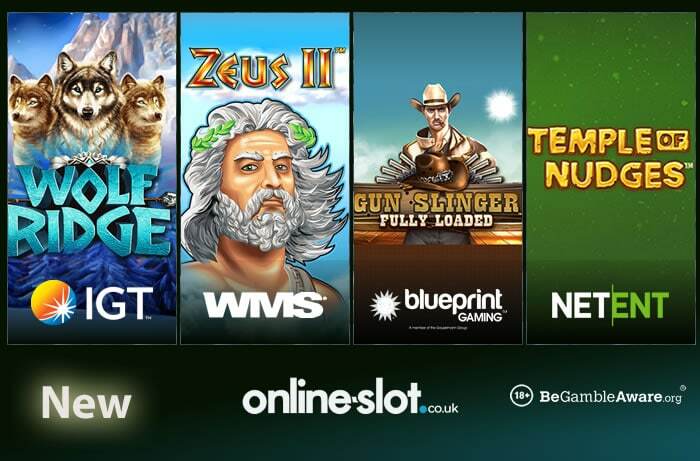 With superb new slots released this month, there’s 4 more for you to enjoy – you have Temple of Nudges, Gun Slinger Fully Loaded, Wolf Ridge and Zeus II. Powered by Blueprint Gaming, Gun Slinger Fully Loaded is a 5 reel, 10 payline slot with a Wild West theme. Highly volatile, it comes with a Bounty Hunter Free Games feature where up to 20 free spins can be won. More importantly, you choose which symbol expands to give you bigger wins. If you are not patient, entry to the feature will cost you 120 times your stake – it can be worth it as you can gun down 5,000 times your stake on every free spin! By the way, Gun Slinger Fully Loaded is exclusive to LeoVegas Casino for now. Powered by IGT, Wolf Ridge is set under the Northern Lights and is beautifully designed. With 5 reels and 30 paylines, the Prize Disk feature sees you win cash prizes – the wolf scatter appearing on reel 3 will treble your outcome too for wins of up to 210 times your stake. It gets better in the Free Spins Bonus feature where up to 250 free spins can be won – with double value symbols, the Prize Disk feature can apply (as well as the trebling wolf scatter) for even more cash prizes. Wins of 1,000 times your stake are possible on every free spin. Powered by Novomatic, Pyramid Fortunes takes you, again, to ancient Egypt. With 5 reels and an All Pays game engine, it comes with 2 wild symbols – 1 of them doubles your win when appearing on reel 3. The Free Games feature starts you off with 10 free spins but all low value card symbols are removed. The saving grace here is the randomly triggered Jackpot feature where you pick from jackpot gems to win 1 of 4 jackpots – the one you want is the Grand Jackpot which is guaranteed to be at least £5,000. In the free spins, you can win 1,200 times your stake with the doubling wild. Powered by Net Entertainment, Temple of Nudges is a low variance slot with 5 reels and 243 ways to win. Set deep in the jungle, it looks great. There’s a Nudge feature which is played after a winning combination – the reels shift down 1 space to give you more chances to win again and again. There’s also a Re-Spin feature where winning symbols remain on the reels with the other symbols re-spinning. Again, this gives you a chance to win again. Despite this, it’s not the best slot as you can win only 87.48 times your stake on each spin/nudge. If you’re wondering which slot to play, I would recommend Gun Slinger Fully Loaded as it offers the biggest potential wins and looks pretty good. Saying that, the best slot released this month is Big Time Gaming’s The Final Countdown, which is also exclusive to LeoVegas Casino.